This aquatint was made from plate 7 of 'Views in the Burman Empire' by Captain James Kershaw. 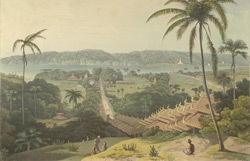 Kershaw's views were among the first to present images of Burma to the British public. In the tradition of many soldiers of the 18th and 19th centuries, he was also an accomplished artist, trained to record what he surveyed. He survived the Burmese campaign (1824-26), but died in 1839 in Afghanistan. The first Anglo-Burmese war caught the British without adequate planning and the logistics of the campaign proved more difficult than they imagined. Supplies had to come all the way from India and many soldiers died of disease. Kershaw's picturesque drawings omit the tribulations faced during the war. Here he depicts the approach to Shwesandaw Paya at Prome: "This view was taken from the Terrace of the Pagoda, and more distinctly shows the construction of the covered ascent. The road leading to the river was principally occupied by the Navy and Madras division of the Army."